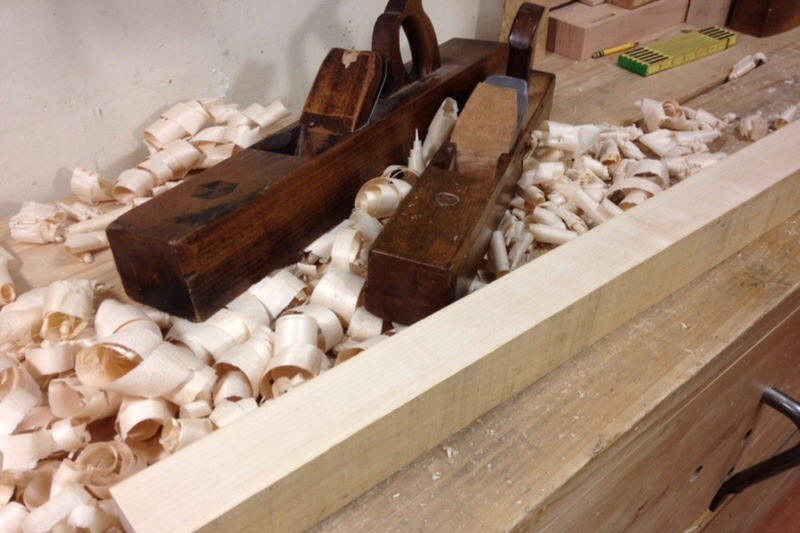 I’ve been talking about the speed at which period woodworkers were capable of working at. In case you’ve missed it, the short version is that they were capable of working at incredible speeds. They were likely able to work just as fast with hand tools as most of us can work with machines today. There is a little more to it than that, though. 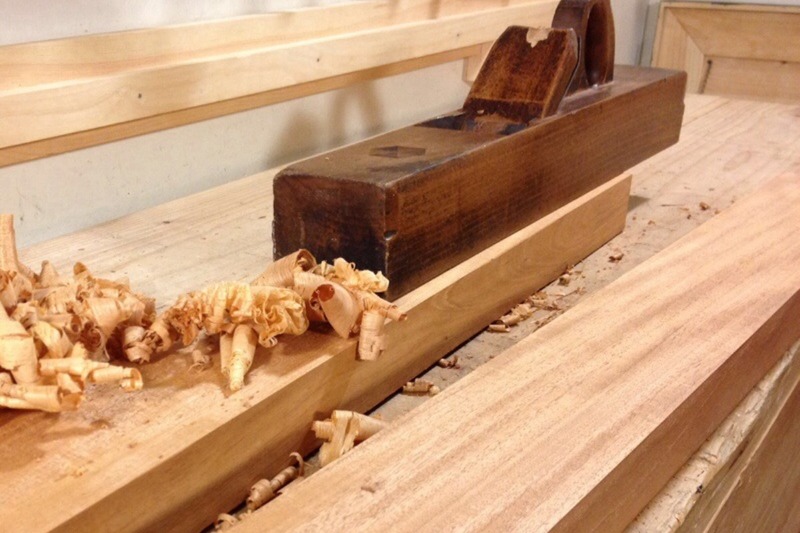 While period craftsmen were certainly capable of working at incredible speeds by hand, they didn’t just grab any old board from the home center and go to work. Boards were carefully selected for the task at hand. However, today, with the aid of machines, many of us don’t give a lot of thought to the material we’re using, other than what it looks like with a finish on it. I’ll give you an example. I once had a conversation with a relatively new woodworker who was having trouble using his hand planes. He had bought some rough sawn lumber and was working on flattening the face of one of the boards. Here’s a paraphrasing of how the conversation went. Him: I’m trying to flatten a rough sawn board with my hand planes, but I’m having a lot of trouble. Me: OK. Well, what’s happening? Him: I have the plane set for a fine cut, but all I can get it to do is make dust. If I try to deepen the cut, the plane comes to a hard stop and won’t budge or cut at all. Him: Yes, it’s freshly honed with a slight camber. Me: What kind of wood are you using? Him: I’m using a piece of kiln dried oak. What am I doing wrong? This scenario is not uncommon, even for folks who have been woodworking for a long time. So what’s the problem? Well, it’s the material. To see why, let’s start at the beginning. “I have the plane set for a fine cut, but all I can get it to do is make dust.” Herein lies material problem #1. These days it seems like every plane, regardless of size or perceived function, is set up to be a smooth plane. This creates a problem that may not be immediately obvious to the new hand tool user. You see, that gossamer thin shaving is both a blessing and a curse. For gnarly, interlocked, reversing, figured grain, not much else but a very sharp iron pitched at a high angle in a plane with a very tight mouth set to take a very thin shaving will be capable of smoothing that board. So for smoothing really difficult grain, that super tuned smoother is exactly what you need. There’s a catch to this though. In order for that super smoother to do it’s job and take that gossamer full length shaving, the board needs to be dead flat. If it’s not, the plane will simply ride on the high spots. So if you are planing rough sawn wood, all that plane will be doing is ticking the tops of the sawmill marks, creating really tiny broken up shavings…dust. Eventually, you’ll cut all the high spots off and take a full length shaving, but it’s going to take you an awfully long while with a plane set so finely. The answer of course is to deepen the cut, until the board is flat enough that the smoother can plane it with such a thin shaving. This brings me to material problem #2. “I’m using a piece of kiln dried oak”. The solution to this one is simple. Use different wood. Seriously. While hand planes are certainly capable of handling very hard woods, like this hard maple, doing so requires very sharp blades, very light cuts, and lots of patience. As I mentioned above, period woodworkers didn’t just walk into the home center and pick up any random board. They chose their lumber carefully based upon what it was going to be used for. Almost every piece of period furniture contained primary and secondary wood. For example, case sides and drawer fronts might be made from walnut for its color and beauty, but the drawer sides, drawer divider frames, case backs, and other parts that aren’t visible in the finished piece, would be made from a secondary wood, like pine or tulip poplar. The reason for this is twofold. First, these secondary materials were less expensive, to a degree. But more importantly, they were much easier to work with hand tools. Similarly, primary woods like mahogany, walnut, and cherry weren’t just chosen for their aesthetic qualities. They were chosen because they were easy to work with hand tools. Case furniture from the 18th century was simply not made from hard maple. This wasn’t just limited to the furniture of early America either. Historically all around the world, furniture woods were chosen for their ease of working. In England, furniture of the 16th and 17th centuries was made primarily from green oak (way easier to work with edge tools than kiln dried oak). In the 18th century, much English furniture was made from walnut and deal (a kind of pine). In Australia, a country known today for some of the hardest woods to work by hand or machine, most furniture was made from different species of local pines. The same thought process is still just as important in hand work today as it was 250 years ago. One simply needs to choose their woods carefully and strongly consider their working properties if the desire is to work by hand. I still try to adhere to this practice by sticking to species like walnut, cherry, mahogany, soft maple, poplar and pine. Hand planing mahogany is pure pleasure. There’s a reason this wood was so sought after in the 18th century. Not only is it beautiful, it works like a dream with hand tools. On the other hand, I try to avoid species like hard maple, oak and hickory in their dry form. When these woods are kiln dried, they are very difficult to work with hand tools. This is one of the reasons that these woods make such good tools and tool handles, and consequently why they were so often used for these items. If you do need or desire to work with extremely hard species by hand, there are a couple of strategies you can take for dealing with these woods. First, try to do as much of the work as you can while they are still green. Green oak, ash and hickory are actually very nice to work with. They get more challenging the drier they get. Hard maple as well isn’t terrible to work with and actually turns really nicely when it’s green. Many Windsor chairs have legs rough turned from green hard maple and then the turnings are just refined after the wood has dried a bit. If you need to work with these woods after they have been dried, you’ll need to use really sharp tools and take really light cuts. For planing these kiln dried woods in the rough, take light cuts and work across the grain as much as possible. Doing so will make the job of planing them easier because the fibers have less resistance to a cross grain shearing cut as opposed to a long grain cut. Cross grain planing also results in less tearout in woods with difficult grain. Still, it is going to be slow going no matter how you slice it. These really hard woods just won’t tolerate big thick cuts, along or across the grain. So if you are just learning to work with hand tools, don’t despair. You may not be doing anything wrong at all. Simply switching materials may be all the help you need. Start with easy to work woods like poplar, pine and mahogany. Avoid knots at all costs, and only step up to the much harder woods and exotics once you understand the basics. Once you have enough experience with your hand tools, you’ll know what they can do quickly and you’ll know when you need to slow down. Posted in Materials, Random Thoughts, Wood and tagged efficiency with hand tools, mahogany, maple, oak. That’s an article that really helps. In most of cases the emphasis is on the hand tools and the material is often neglected, and thus there are tons of tutorials teaching how to plane, how to sharpen, etc., but they avoid to focus on the wood being used, that is what makes the real difference in my opinion. One thing is to use a really sharp edge on a good wood to work with, another is to use this same sharp edge to work with wood that is not suitable to hand work… My opinion about woodworking with hand tools is that the biggest knowledge relies on the material… starting with a good wood makes the rest a lot easier… the problem is starting with a difficult material and try to apply the same techniques taught around. What becomes true, browsing on Internet, is that a fine set plane can handle any material. This is even a belief, but due to the lack of information. The equation must be balanced. For example, the best tool will not be enough used in a poor material and maybe a very poor tool might have an excellent performance in a good material.. so balacing both things is the deal.. I totally agree Walter, and thank you for the comment! Material choice is so important. And when one is first learning, it’s even more important. In fact, I’d say that for someone who is just starting out in hand work, it’s even more important to spend money on good material than it is for someone with a bit more experience. Often beginners don’t want to spend a lot on wood for fear of ruining an expensive board, but they do themselves a disservice by purchasing cheap material because that material is then harder to work with. I’m reminded of a well known how-to-dovetail video put out years ago by a woodworker who is very skilled and whom I have great respect for. The dovetailing demonstration was done in walnut (pin board) and holly (tail board) for the greatest contrast for filming. However, what is not mentioned in that video is that the holly will compress much more so than the walnut, making the joint fit together really nice and tight with zero gaps, even if the tails are a couple of shaving too fat. I spoke to a fellow woodworking club member shortly after he had watched that video and he was having a lot of trouble applying the teachings, because he was using big box store oak in an effort to save money by not buying walnut. All along the problem was really more because of the less forgiving material than his practice. Now I know for a fact that the person who made the video would have been just as capable of making the same air tight dovetail in ebony and maple. But for a beginner, it’s important that the material be considered carefully, and this just wasn’t something that was stressed enough (at all?) in the video, or in most educational material on hand work for that matter. I think the green woodworking books and videos do the best job of stressing the importance of using the right material. Unfortunately, the point just isn’t stressed enough in other aspects of hand work. I found this article while trying to diagnose a problem I was having. I think you’ve given me the answer but I’ll ask my question anyway just to confirm. I put down a red oak floor in my shop and have a bit of scrap left. I have been using it to make boxes and other projects. The problem usually occurs when I am working up the stock. I have no issues with edges and working the faces with a scrub plane and a jointer is ok. The problem comes when I put a finely set smoothing plane to the faces. It just skates over the top and never takes a shaving. I even keep advancing the blade and nothing. I put in a pine board and it works great – shavings of any size I want. It doesn’t always happen with these boards but several times over the year or so I’ve been messing with them. So I think as you said, the problem is the material. I am just curious as to exactly why it does this. My guess is that two things are going on. First, the blade might not be sharp enough to take a really fine shaving. A really fine shaving requires a very sharp edge. Second, the material may not be flat enough. In order to take a really fine shaving, the face needs to be really flat. Flooring can frequently have a bow in it. So a finely set blade will just ride in the hollow created by the bow. The jointer might be heavy enough to bend the bow out but it might be springing back when the weight is removed. Also, especially in oak, the growth ring plane (tangential plane) can be especially hard to plane. The edges would be easy because they would be the radial plane, which always works easier, especially in the oaks.